Iran’s Assembly of Experts has chosen two potential successors to the Supreme Leader, according to Assembly member and former President Hashemi Rafsanjani. Rafsanjani told a reformist newspaper that a committee of the Assembly has held “discussions with several hundred people” regarding the succession. He gave no information about the two men selected, saying the details are “confidential”. The Assembly of Experts first convened in 1983. It has only chosen a Supreme Leader once in the Islamic Republic’s history, selecting Ali Khamenei to replace the Republic’s founder Ayatollah Khomeini in 1989. 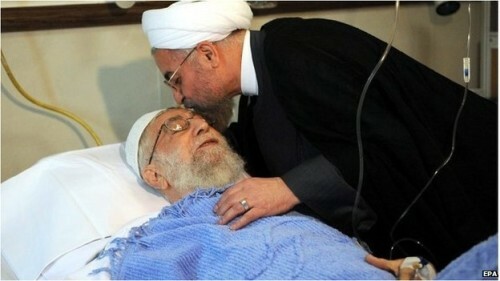 Khamenei, 77 next month, has had periodic health scares and may be suffering from prostate cancer. He has shown no signs in recent years of leaving office, but he was hospitalized in March 2015, possibly for treatment of the cancer. Rafsanjani had made the controversial proposal for a Leadership Council to succeed the Supreme Leader upon Khamenei’s death. He was harshly criticized by hardliners and conservatives — to the point of being accused of “sedition” — when he renewed the initiative last December. The former President did not mention the possibility of a council in his interview last weekend. Rafsanjani also spoke optimistically about the future of his ally, President Rouhani. The reformist newspaper Ghanoon has been shut down by an Islamic Revolutionary Guards Corps complaint that it was spreading “libel and falsehood”. Reasons were not given, but Ghanoon ran an article on June 11 which criticized conditions in a Tehran prison. It has also challenged the Guards, including the IRGC’s detention of 10 American sailors in early January. Jahan News was shut down last week over “false stories”, including one claiming that Taliban leader Mullah Akhtar Mansour — killed in a US drone strike in Pakistan on May 21 — held negotiations in Iran over a two-month period.